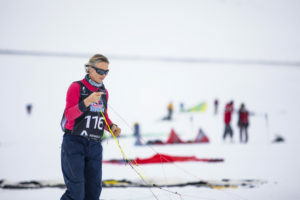 The 250 competitors arrived on the Hardangervidda plateu for the start of this 150km snowkite race. 5 gates, 5 laps, 5 hours and it’s a physical and mental challenge with each decision being critical to your speed, performance and position. Olly started on the 15mtr VMG , Eric on the 15mtr and Steph 12mtr. 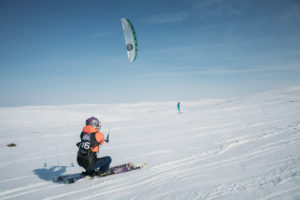 Joining us from the youth Academy, Ben Daffin riding in his first snowkite event. The first 4 gates went well with Olly top 5 and Steph around 10th until the dreaded happened! Steph felt a drop in wind and was climbing higher to get the last of the breeze before it completely dropped out. The front of the fleet got ahead through the hole while Steph ended up walking up for 30 minutes however the wind then came in stronger from the lake so this cost alot of time and she got overtake by many kites. A quick change for the 15mtr and Olly on the 18mtr while Eric hooked up the ozone Chrono 18mtr. We all had fire in our bellies and calories to burn, there was some catching up to do. Steph’s goal was just to finish and not actually bothered about the other competitors. Some good tactics upwind and downwind took Steph back on target time until the final beat to the finish with the wind dropping again. Steph climbed high and went around 3 mountains to keep the wind , sailing a far longer course but keeping moving forward and skating to get to the finish. The last 100mtrs Steph skated to the finish with no wind at all. Meanwhile 35 minutes later the yellow kite appeared from the same mountain. The main man Eric also made the great tactical decision and came out smelling of roses. Just missing the cut off time by 3 minutes, however still an incredible 16th position overall. Meanwhile, Olly had legs on fire having hung on to his 18m VMG with a set of race skis and totally maxed! An impressive time of 3hrs 40mins while Steph came in 4hrs 40mins and Eric 5hrs 18mins. 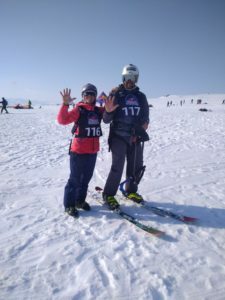 Ben completed 3 laps and an impressive 32nd overall. 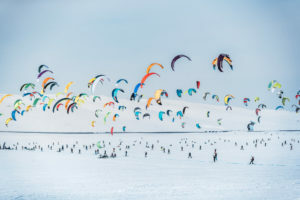 The 2019 RedBull Ragnarok, another huge mental and physical challenge and a must for any snowkiters out there.